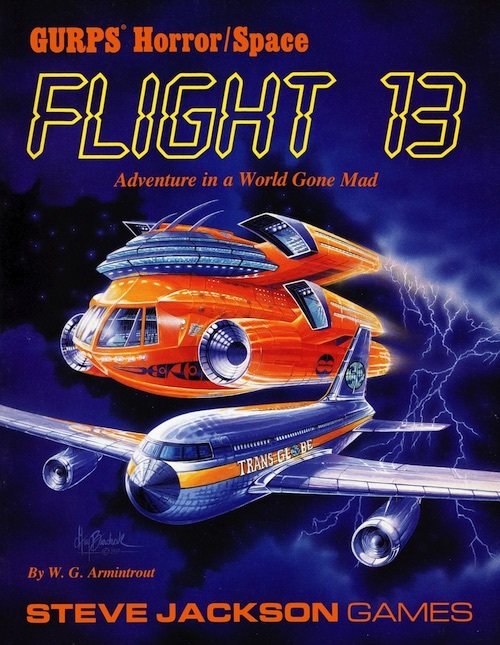 Ladies and gentlemen, we regret to announce the Flight 13 will not be proceeding to your destination at this time. In fact, we won't be proceeding at all. And neither will you. Suddenly, the routine of air travel becomes anything but routine. Only the wits and courage of the passengers, and the minimal equipment they can carry, give any chance for survival in a world gone mad. 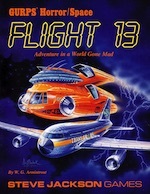 Flight 13 is a mystery adventure for the GURPS system. It requires only the GURPS Basic Set, Third Edition, but is compatible with any other GURPS modern or futuristic worldbook. In particular, it fits very well with a Space, Horror or Illuminati campaign. A complete adventure for the GURPS system, with alternate details for modern and futuristic backgrounds. Suggestions for the GM who wants to customize the adventure to fit an existing campaign. New scenario ideas for expanding the adventure. Detailed descriptions of an aircraft, airport and city, with information usable in any setting. Two new alien races, with complete GURPS specifications.